Fishing over the long weekend was generally good. With the streams and rivers now closed the lakes are still a very fishable option with fly, spin, bait and troll all being fish catching methods at this time of year. Bugger the snow, just keep on fishing! You may recall in the report a couple of weeks back, that a huge brown of seven plus kilos had been caught spinning in lake Eucumbene. 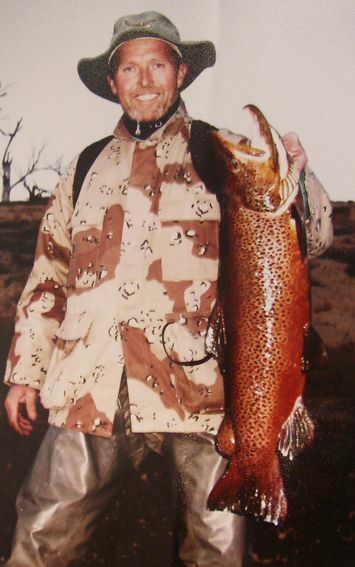 We have managed to get a photo of Gino Meznarsic and his cracker of a brown taken on the ever succesful Snowy Minnow. The fish was caught off the bank and later released after Gino and his father Mario spent some time reviving the fish. Though the rivers are now closed here are some reports from the long weekend. I got this 6 pound 60cm male in the Eucumbene river on Saturday. He came up right after I hooked him on a rabbit fur bead head I tied and (lacking a net) I jumped in and grabbed him bear grills style. So only a twenty second fight but he was a slippery bugger and I was lucky to land him. Its my best trout so far and definatley the best way to end the season. Lake Jindabyne:- Jindabyne reports have been quiet also but polaroiding can be had at anytime now when the conditions are good. Bright, still sunny days with a large high pressure system are ideal. Rainbows have been on the daphnea and deep trolling in open water has accounted for some great rainbows. Tassies in S12, 36, Y94 are excellent colours to use on these fish at present. The Angler's Reach arm would be a great place to try spinning with plastics and vibes down deep and you can account for browns and rainbows in this area. Look for the river bed on the sounder and work your lures through it. Jindabyne:- Has been productive with some nice fish flatlining tassies and also on tassies on lead core. Once again this week closer to the township seems better than the river mouth and arm areas. Jindabyne has produced a few fish too over the weekend with grubs being the dominating bait. Winter is a great time for chasing rainbows on grubs and though it is cold, these fish will give many anglers a heap of fun and food over the next couple of months.